Space elves terrain input needed for a terrain manufacturer! Comments as to what you want in "space elf" terrain. Line of sight blocking pieces, ruins, area terrain? Leave a comment here. The owner of Horizon Creation 3D is reviewing this thread for feedback to help in designing the line of terrain! Wow, cool idea! I'd like to see a LOS blocking tower with measurements similar to an Imperial Bastion. The interior structure needs to maintain a tapering ovaloid/cylindrical shape, equally wide at the bottom and top but the middle is thinner. The outside pillar supports need to have keel blade shapes. Well as for DE terrain I always thought that there is a problem to actually make the architecture both functional and aesthetically distinct. I hate to see pieces of terrain that are too small for a building (out of scale) or way too complicated so the arguments about LOS take place at the table. Also certain corellation between the size and intended "function" and the amount of ornamentation. 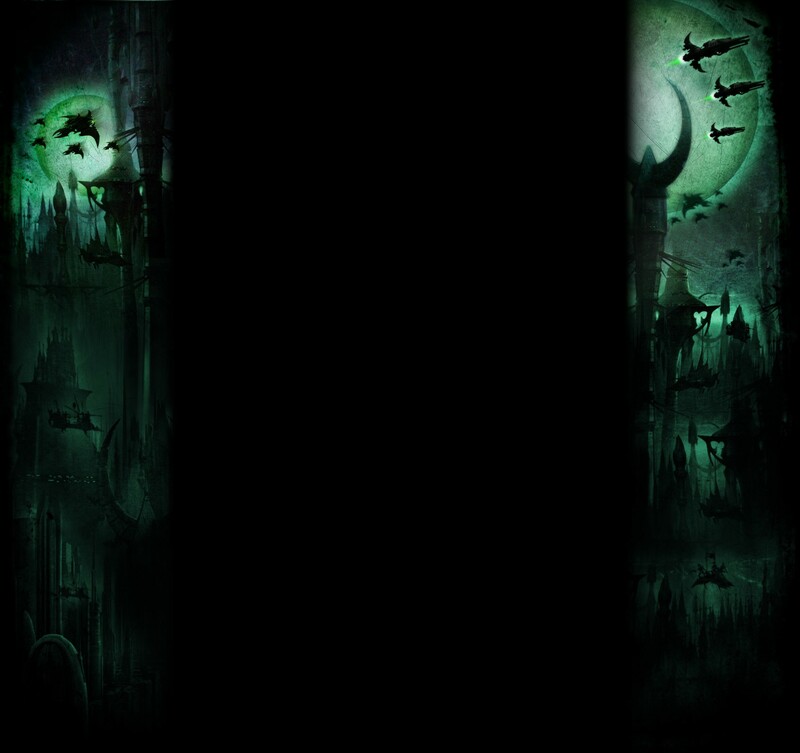 Not mentioning there are probably no purely Dark Eldar buildings in the galaxy. But I can imagine something like orbitally launched "pods". Dark Eldar landing platforms, Defensive lines, Grav-mounted weapon emplacements, etc. These would be more functional than aesthetical IMO. Eldar ruins are a different matter, but DE and CWE ones would not differ much. I have not seen a lot of pre-fall terrain pieces that would display signs of the Eldar society going into debauchery and hedonism. That may be a nice piece. Something a CWE would look at and remember the state of their society just before the birth of Slaanesh. I would wish for terrain to stimulate the top spires. Like only platforms and gang ways from one to another because the table represents a 1000 km drop. That's exactly the sort of look I'd be going for. I'd definitely like to see a full range of DE terrain. Large LOS-blocking pieces, buildings, ruins, area terrain, portals, towers etc. 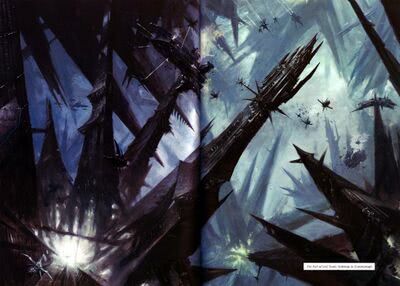 Dawn of war dark eldar buildings would be amazing. Also spires, high spires. This guy built something I would consider a dark eldar bastion. Basically Orthanc from The Two Towers? If they would fit size wise to the Geedub versions it would be relatively easy to get 'Ok' from TO's to use them as counts as models. All of these could fluffwise be justified to be grown/teleported/webwayportalled in as small fortifications. If the designed well the basic structure could be the same and the version (dark or CWE, Harlequin?) could be modified with additional parts keeping the versions more consistent with the each other and size wise. 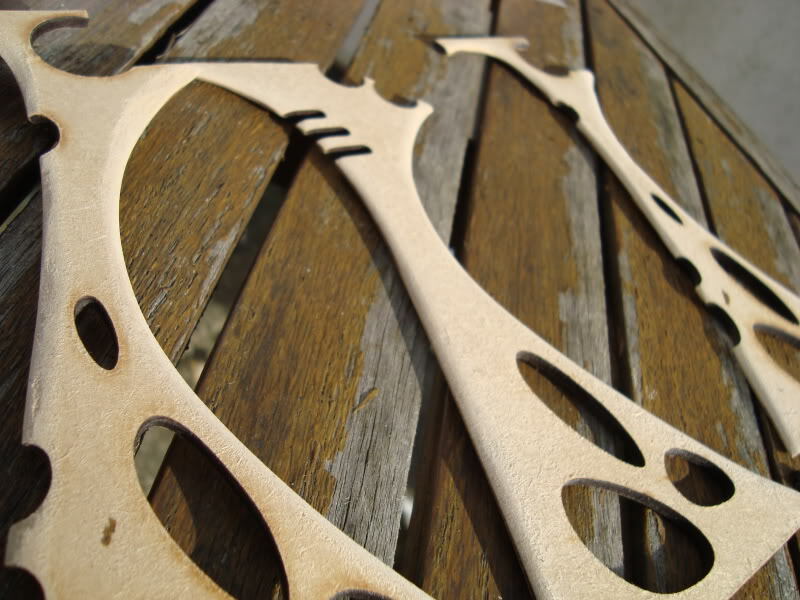 Considering Eldar aesthetics using ABS, like they are, and running the additional parts through acetone surface treatment could make a big difference on how the end result looks like. I like the idea of 3D printing, and own one for making terrain with couple of friends. The trouble sometimes is to get a model look like it is made of something else rather than sandstone or weathered lime stone due the layer adding process regardless of the configuration. This effect is well visible on the webway portal. I hope that they get things rolling! Dont forget the void shield generator! Got some terrain I've been working on which may inspire ideas. These are older WIP pictures. They are mostly finished today though. I think it should float ominously. Literally everything the Dark Eldar make floats. Concepts such as "up" and "down" are sometimes described as not applying in Commorragh. There's a lot of structures and walkways, but it's not clear that there's a "ground." Because they don't typically fight prey species where they live, and because they're all about lighting-fast raids, any structures would need to be rapidly deployed, possibly into uncertain or unsuitable terrain. As such, ominous floating would be functionally advantageous. The Dark Eldar, wishing to have things to hide behind, employ a weapon on their orbital ships which fires large quantities of giant, Raider-obscuring, blade/harpoon things deep into the planet's surface. Or maybe they use their aircraft to seed rapid growing crystals, or bone structures using technology similar to Ossefactors. The True Kin certainly have the ability to rapidly to remake the surface of a planet so that their troops have things to hide behind. I like the idea... They dont want to bomb the area as they would not be able to experience the pain and suffering firsthand and would cut down possible slaves numbers, so they turn things into their advantage. Well based on their tactics and their soul being consumed at a rapid rate I would doubt they would ever build permanent structures in realspace ... unless they were simply using slaves to build emplacements or monument to state hey I was here or some sort of embassy in which would reside a webway so as to strike from and have easy access to their mercenary or slave forces. If they are fighting in the webway, which they soon might be doing with Khaines gate going to crap ,I'd say go nuts. Tall spires made of steel and crystal/glass with a look focusing on sharp and pointy. First thing came to mind is webway portal, big webway portal. No offence, but half of the things on the thread looks like terrible spiky boxes. That wouldnt pass as decent even with old style DE. 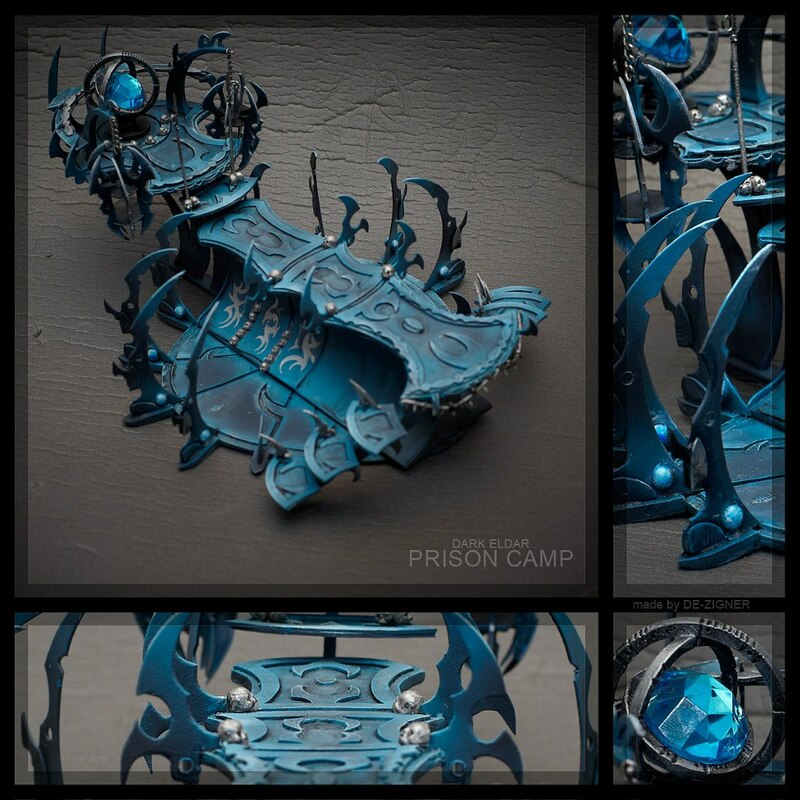 Another thing is temporarily slave camp with mini webway portal. Point is - it shouldnt be fortification as such, with walls, etc...its a structure that serve a purpose. Preferably there should be lots of ways to cause pain around it, to impale something...etc....just spiky curvy dark aaaeeaeaelvy stuff is not gonna cut it. It must be well though out, like prison above, it has a place to park Raider there, it can unload prisoners downstairs, where they will be held beneath force field, guard can walk on the balcony to occasionally shoot splinter rounds to the prisoners, there is a control area that holds some comunication/cloaking apparatus. Very cool. And spiky towers - while good as an object of self art - does not contain any real value outside "i made it'"
Azdrubael, I totally agree if we are going to be creating terrain with its own rules and supported by GW/forgeworld. However, I think your scope is the equivalent of a space rocket to the moon when a cannon ball is being asked for. The purpose is counts as terrain for Macro Cannons, Bastions, Shrine of Aquila, copse of trees etc. to which you need to apply something of similar size/footprint for the rules of terrain to apply to that would fit Dark Eldar stylization. Look at what the company made previously and look at what you are requesting. Looks awesome but is it practicable? Well, then take my advice in principle, rather then form. If you want to create DE version of imperial fortifications you should aim for notable lack of solid structure. They probably wont be LoS blocking terrain. 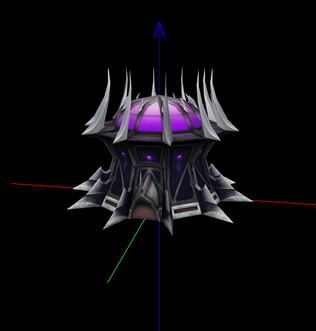 Bastions should probably be elevated platform with gunports similiar to what you see on Ravager model. It can even use same bits, or be compatible with them. Shrine Of Aquila can be same height webway portal with solid *portal* stuff at the center. That can be LoS blocking. That seems easiest thing to do. 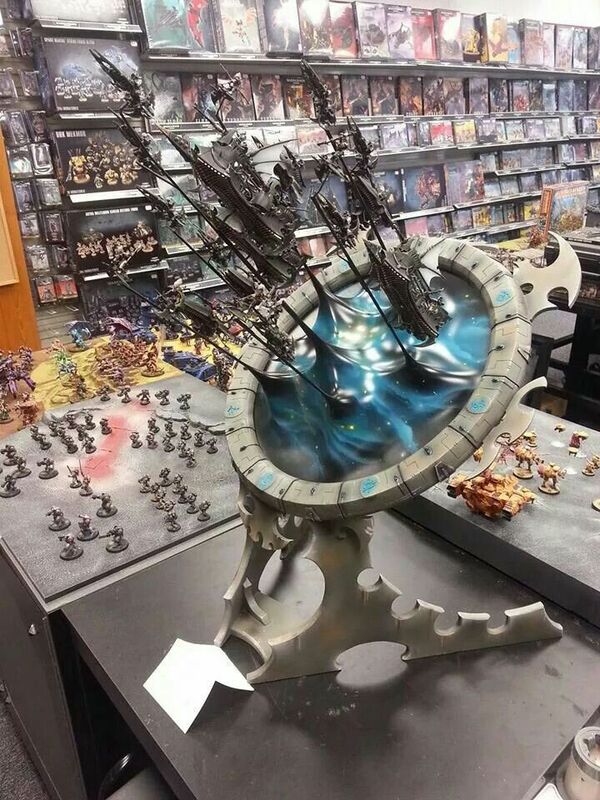 All Dark Eldar players want to have some sort of portal in their deployment zone. If it can use GW rules, all the better. Even if its just LoS block - that fine. Subject: Re: Space elves terrain input needed for a terrain manufacturer!